It's Halloween, so my question to you is the following; "Have you played 'Magic Cat Academy' yet?" Not sure what I'm talking about? Google has released this incredibly addictive mini game just for this years Halloween celebrations, and yes, it's extremely addictive! Players must draw symbols using either a mouse or touchscreen to get rid of all the ghosts that slowly advance towards the main cat character Momo. 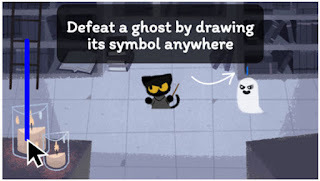 You'll need to draw the specific symbol floating above each ghoul's head to defeat them. There are a number of symbols used in the mini-game, including horizontal and vertical lines and v shapes and combinations of these. It not only has beautiful graphics in a simply, yet artistic style, but you play right within your browser on PC, MAC or Mobile! Although I must admit, Mobile is easier. If you want to check out this fun little mini-game simply go to Google's Homepage https://google.co.uk and click on the play button!